Before the Reformation – which in Scotland is usually stated as starting in 1560 – Southend consisted of two parishes: Kilcolmcille and Kilblaan. The ancient church of Kilcolmcille was dedicated to St.Columba and its ruins still stand in the graveyard at Keil, about a mile through the village. The original church and churchyard of Kilblaan – St.Blaan was said to be a nephew of Columba - were situated on the east side of Conieglen Water (which runs behind this present church) on land which is now part of the farm of Kilblaan. Erosion from the river – which is quite turbulent when in spate – eventually made it necessary to close the church and build a new one on the mound where this church now stands. This building, however, is the third church to stand here. The first church would have been a small thatched building, the second a slated edifice without any seats which fell into disrepair around 1768. At that time the population of the parish was 2000 and the part of the parish called the Learside was very thickly populated and consideration was given to building the new church on Eden Farm. However, with the Church of Kilcolmcille in such a bad state of repair that it was considered unsafe for worship, and with old site being roughly in the centre of the parish, the current building was erected in 1774, a few yards west of the original site, and St.Blaan’s became the parish church. Slated and with seats in it, the roof of this church consists of Norwegian pine, brought directly from Norway by sea and landed at the Port of Dunaverty. The porch and the choir stalls were added to the original building at the expense of Ina, Dowager Duchess of Argyll who also, in 1911, installed the stained-glass windows in memory of her husband and Queen Victoria. An earlier Duchess of Argyll, Elizabeth Tollemache, who died in 1735, had changed the name of the parish to Southend. The Duke of Argyll was the principal heritor and overlord of Kintyre and under the patronage system it was he who chose and appointed ministers to serve in the parish. In 1794, the Duke presented Rev.Donald Campbell to this parish. Donald Campbell was a bachelor and it is said that his behaviour and manner of life in the eyes of the people did not become a minister of the Gospel! Apparently he indulged too freely at dinners and other social functions and was a little neglectful about worship and his parish duties. For this reason the whole congregation decided to build another church and call another minister of their own choosing. The Relief Church of Southend was founded in 1797 and built near the village, which was then called Muneroy. However a dispute arose between those of Highland extraction, who wanted to call a Gaelic speaker, and the Lowlanders who wanted their new minister to be English-speaking. Eventually it was decided, by a majority, to call an English-speaker. Upset by this decision, the Highlanders left the new church and returned to the parish church to which the Duke of Argyll continued to appoint ministers until the Disruption of 1843 when, thereafter, the congregation chose their own minister. However this change occurred peacefully and agreeably in Southend because no Free Church congregation was ever established here. The new church, at Muneroy, joined the Relief Synod – which was against patronage – and became St.Columba’s. 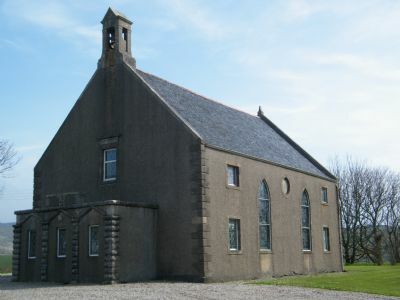 A new building was opened in 1890 and the church was served by a succession of ministers until – having become part of the United Free Church and then, since 1929, part of the present Church of Scotland – joint services began between St.Blaan’s and St.Columba’s in 1943 and the two churches were united in 1946. Services at St.Columba’s (which is still standing opposite the shop, though no longer used as a church) were discontinued at the end of 1965 and since then the parish has been served by one church and congregation now known simply as Southend Parish Church. Today the parish population is around 450, nearly half of whom are members of the congregation. The main occupation is farming – dairy, beef and sheep – with most of the milk produced in Southend going to the Campbeltown Creamery to make Kintyre Cheddar cheese. Most local farmers are no longer tenants but own their own farms, the Duke of Argyll having sold his Kintyre estates in 1955. The parish is fortunate in still having an excellent Primary School, our own doctor and a brand new surgery, a fine, and recently refurbished, hotel, a first-class shop and tearoom, and a very good golf course.